This program gives entrepreneurs who have a start-up business concept support and services from event sponsors to help them get their business concept off the ground. Valued at tens of thousands of dollars, these valuable services can help entrepreneurs turn their business concept into a reality. Nominations for the Pittsburgh Business Pitch will be accepted through April 19th. Finalists will be notified the week of April 26th. To nominate your remarkable business idea, it is required that you live within the 10-county western Pennsylvania region. You can nominate your business idea for the Pittsburgh Business Pitch, or you can nominate someone you know. This can be done by filling out a form at www.pittsburghbusinesspitch.com where you will pitch your business concept and submit your business name, contact information, and vision. From these nominations, 12 finalists will be chosen and will be provided with a booth on the main floor at the Pittsburgh Business Show May 14 and 15. This will give the Pitch finalists with the opportunity to present their business idea to exhibitors, attendees, and the Pitch sponsors. All Show attendees will be able to cast their vote for their favorite business concept using text-to-vote technology provided by Fyre, a Pittsburgh-based company who supported the Pittsburgh Business Show last year. Pitch finalists will be encouraged to their business concepts on their social media pages to reach out and gain more votes from the community, business executives, friends, investors, and fellow entrepreneurs. The business concept that receives the highest number of total votes will be presented with the Pittsburgh Business Pitch award on May 15th at the Pittsburgh Business Show’s main stage. The winner of the Pittsburgh Business Pitch will be provided with the services and support of the Pitch sponsors to help them launch their business concept. Nominate Your Amazing Business Idea Today! 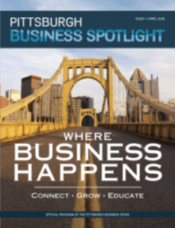 The Pittsburgh Business Show, the largest business-for-business tradeshow in the region, is on May 14 and May 15, 2019, at the David L. Lawrence Convention Center. Visit www.PittsburghBusinessShow.comto purchase your ticket or become an exhibitor today!